On 14–15 April 2016, WHO in cooperation with the Ministry of Health of Montenegro held training in Podgorica for interviewers who would be involved in conducting the WHO European Childhood Obesity Surveillance Initiative (COSI). During the training, several important thematic issues were covered including the importance of COSI and its implementation progress at the WHO European regional and national levels. students from the Faculty of Sport and Physical Education at the University of Montenegro. 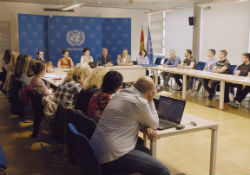 Participants were welcomed by Ms Mina Brajovic, Head of WHO Country Office in Montenegro, as well as two principal investigators: Dr Boban Mugosa, Director of the Institute of Public Health of Montenegro, and Dr Stevo Popovic, Dean of the Faculty of Sport and Physical Education at the University of Montenegro. From May to June 2016, the country will conduct COSI for the first time, and measure children from the first and second grades of elementary school.